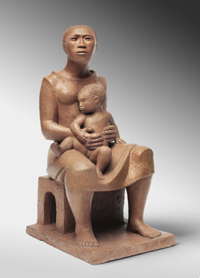 Elizabeth Catlett moved to Mexico in 1946 and remained there until her death in 2012. Profoundly influenced by the political idealism and social-realist aesthetic of Mexican artists such as David Alfaro Siqueiros (1896–1974) and her close friend Frida Kahlo (1907–1954), Catlett developed a personal vocabulary that emphasized human rights and the dignity and strength of women of color. She created Mother and Child while working at the famous Taller de Gráfica Popular, a printmaking collective that worked to better the social conditions of the working classes, the poor, and the dispossessed.